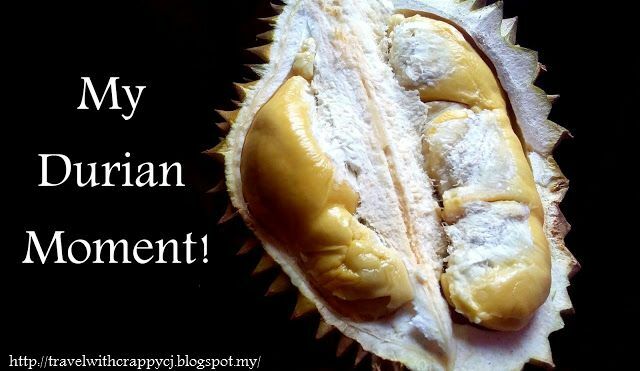 So durian season has started and for those who don't know what 'durian' is please Google. Okay, for once I won't be mean. Durian is known as King of fruits in Malaysia. *Interesting facts alert- King of fruits in India is mango and in Brazil is avocado and I don't know how true this information is. Now really please Google it! Every time durian season starts my dream is of course about eating it. This time, it is quite unfortunate that I have to eat it all alone as I am no longer staying with my family because I am studying far away from home. This must be the first time where I bought a durian on my own as my 'super skilled can scan through durians to see if it taste good dad' always volunteer or gets forced by us to get durians all the time. That's when my mom will cook sticky rice or known as glutinous rice with coconut milk to eat with durian. Of course, who cares about what goes well with durian. As long as I got to eat durian, I am happy! Everybody usually gathers at the living room where dad will sit in the middle among all the durians and open one by one. Of course, as the one who gets to open it first, he gets to taste it first as well but that's the only time he could get to eat it. Once he passes it to us he knows that he will never get it back. The laughter and fun we had back then is something to be cherished forever. Guess what made me love about durian season is the time where we used to gather as a big family and eat it together. Now even though the durian I bought tastes great but it doesn't feel like how it used to be. I just miss my family I suppose.